December, 2013 - Sometimes a hotel room just isn't enough. For those in search of parlors and patios to gather a far-flung family or privacy in the form of their own moonlit pool, booking a villa, cottage or condo is the way to go. "The biggest benefits are more space, more privacy and the convenience of having a kitchen," says Jon Gray, senior vice president of HomeAway, a vacation rental company. Rentals often come at less cost than booking multiple hotel rooms. "The average rental is $1,500 a week for a two-bedroom, two-bath property," Gray says. "The average hotel room is 325 square feet, and the average vacation home is 1,850 square feet." Some villas, especially in the Caribbean, come with a butler who can serve you a daiquiri at sunset on your private deck and a cook who dishes up lobster curries for dinner. But how to choose? Vacation rental marketplaces, such as FlipKey and HomeAway, function like digital bulletin boards, enabling owners and renters to meet. With huge inventories, these companies do not inspect units. The owner-written descriptions may be accurate or inflated. Typically, there's no on-site management or local team to contact if something goes wrong. 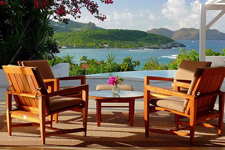 Villa rental companies, such as WIMCO Villas, provide concierge services and destination expertise, and they help match properties to clients' personalities. Villa vacations come with many great bonuses but also some big bewares. Here are some tips to make your time away as sweet as the location. Use a reputable site or agency that's been in business for awhile. Decide how much customer service you want. Vacation rental marketplaces don't match you to a property and don't arrange outings at the destination, but a villa rental agency will do both. Find out if a booking fee for the property you want is required. If an owner has purchased a low-cost posting plan with the vacation rental marketplace, then you may be required to pay the company an additional fee of about 5%-10% of the rental price. Get the rental dates, fees and rules in writing before you pay. Understand what is and isn't included in the rental fee. Some properties may not come with sheets, towels or pots and pans, or the owners may charge extra for these items. Know the payment schedule and cancellation policy. Typically, a 30% deposit is required to hold a reservation and full payment with no refund is required 60 to 90 days before departure, although these rules vary by owner and by agency. Find out whom to contact at your destination in case of a problem, lock-out or an emergency. Pay online with a credit card or through a payment service such as PayPal. These provide more protection should something go wrong than does payment by personal check. Get suggestions about outings and area restaurants before departure from the owners or from the villa rental agency. Discuss how expenses for groceries, car rentals, outings and restaurant meals will be shared by your group. Never assume that everyone plans to share the costs equally and don't leave home with this gang, even if they are your best friends or family, unless you are comfortable with the financial arrangements.